This year the world renowned leading shipping company, Cunard, is celebrating its 175th anniversary. Cunard was founded in 1840 by Samuel Cunard (1787-1865), with the Scottish engineer, Robert Napier (1791-1876), as the British and North American Royal Mail Steam-Packet Company. For the first 30 years the company was frequently awarded the Blue Riband for the fastest passenger cruise liners to cross the Atlantic. In 1934 the company merged with its main rival, White Star Line, to form Cunard White Star Line. In 1950 Cunard bought the remaining 38% and its name reverted to Cunard Line. Since the Crimean War, Cunard offered its cruise liners as troop ships for active service during war time. The British Prime Minister, Winston Churchill (1874-1965), recognised the support of Cunard during the Second World War in his estimation that their action helped to shorten the war by at least a year. During the 1950s and 1960s passenger ships faced serious competition from the introduction and popularity of transatlantic jet airliners. Cunard survived by cutting its year-round services to offer luxury holiday cruises and transatlantic voyages instead, which are still popular today; Cunard is now the only shipping company to operate scheduled passenger services across the Atlantic. In addition to its transatlantic cruises, the company also operates a variety of other cruises and tours, from mini cruises to exotic cruises (listed on its website), with its three ships: Queen Elizabeth, Queen Mary 2, Queen Victoria. America this Year! This very large and rare 1930s poster for the Queen Mary features a stunning image of the ocean liner towering over the small tug boats with the skyline of New York in the background. Queen Mary took her maiden voyage in 1936 as Cunard’s flagship liner. During World War Two she was converted into a troop ship, resuming her normal transatlantic passenger services after the war. She was retired in 1967 and is now permanently moored as a museum and hotel in California. Winter Cruises 1937. This beautiful Art Deco poster features reflective silver outlines on the text with an image of the Laconia and three yachts sailing by palm trees on a beach. Laconia took her first round-the-world cruise in 1923. During World War Two she was converted into an armed merchant cruiser; in 1942 she was hit by a U-Boat torpedo and sank near Ascension Island in the Atlantic Ocean. The Liverpool Route to USA and Canada, 1930s. Britannic was designed for both summer and winter cruising and fitted in the latest Art Deco furnishings for its launch in 1929 as White Star Line’s first motor ship and Britain’s first motor vessel. In 1930 she offered Caribbean cruises during the winter and serviced the Liverpool to New York route then the London to New York route, becoming the largest liner to sail up the River Thames in 1935. During World War Two she served as a troop ship. After the war she offered Mediterranean cruises and in 1960 she was retired and scrapped; the last ship to fly the White Star Line flag. I’m taking my family – take yours! Although this is a White Star Line poster (the four funnelled liner shown is most likely the Olympic, launched in 1911 and retired in 1935 after the company merged with Cunard Line), we couldn’t resist including it. The 1930 image of a young girl holding hands with her family of dolls and waving her Passage Ticket up in the air with joy captures the thrill of travelling by cruise liner; this sense of excitement is still felt today by all who choose to sail across the Atlantic rather than fly. We have more cruise ship and sailing posters listed on our website at www.AntikBar.co.uk, a few of which are also featured on our previous Sail Away blog post. 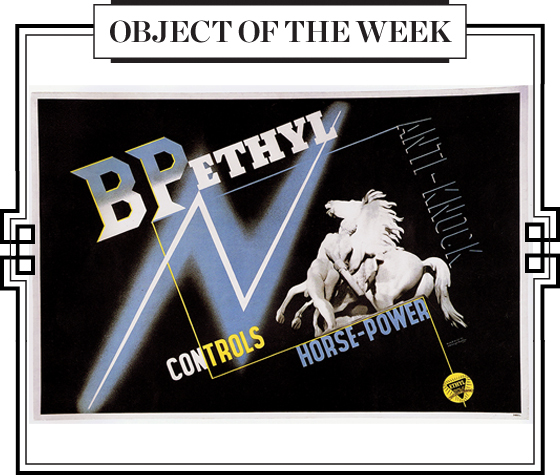 Original vintage advertising poster for BP (British Petroleum) ethyl anti-knock controls horse power. Fantastic photomontage design by one of the most renowned poster artists of the 20th century, Edward McKnight Kauffer (1890-1954). Dynamic image featuring one of the ‘Horses of Marly’ statues (a horse being restrained by a man) from Place de la Concorde in Paris with asymmetrical lettering and a lightning strike on a black background. The V&A in London and MoMA in New York hold a copy in their collections. Kenneth Clark, then Director of the National Gallery in London, praised Shell and BP as “Among the best patrons of modern art”. Framed. Horizontal. Excellent condition. Size: 115cm x 76.5cm. Alexander Rodchenko (1891-1956) and Varvara Stepanova (1894-1958) met at the Kazan Art School in 1910 and later married. Rodchenko, who focused on photomontage in the 1920s, was one of the founders of Russian Constructivism. This was a form of modern art built on the foundations of Cubism and Futurism that aimed to encompass all aspects of everyday life from art and design to film and fashion, influencing later movements such as Bauhaus and Dadaism. Stepanova developed the ideals of this art form to concentrate on costume and set designs for theatre and working clothes for industry and sports.